Here’s the general rundown to make your own savory bite-sized breakfast pies. Make these mini homemade quiches the night before and reheat in the toaster oven in the morning. Or after a long day, pour a glass of wine while you wait for that Pavlovian ring. Make the pie crust two hours to two days in advance of when you anticipate baking. With a food processor or handheld mixer, mix flour and salt together. Add cold, cubed butter and slowly add ice water 1 spoon at a time. You don’t want it to liquify, just wet enough to knead. The cold cubes of butter can be difficult to work with, I ended up using a mincing knife and rubber spatula to mix it all together. On a lightly floured surface, turn dough into a ball with your hands, then into a flattened oval. Cover with plastic wrap and refrigerate for a few hours or up to 2 days. When ready to bake, get our your rolling pin and flatten out the dough on a lightly floured surface. Lightly flour the cupcake pan and line each cup with enough dough so that it overflows the top for that perfectly crisp and buttery crust. In the large bowl, mix all ingredients together. How you like your eggs will determine how much you whisk the eggs. If you don’t like to see white, ensure those eggs get beat. Fill each cup almost to the top. Bake for 30-40 minutes. Wait for the eggs to deflate and enjoy. Or wait till they cool, cover and refrigerate for later. 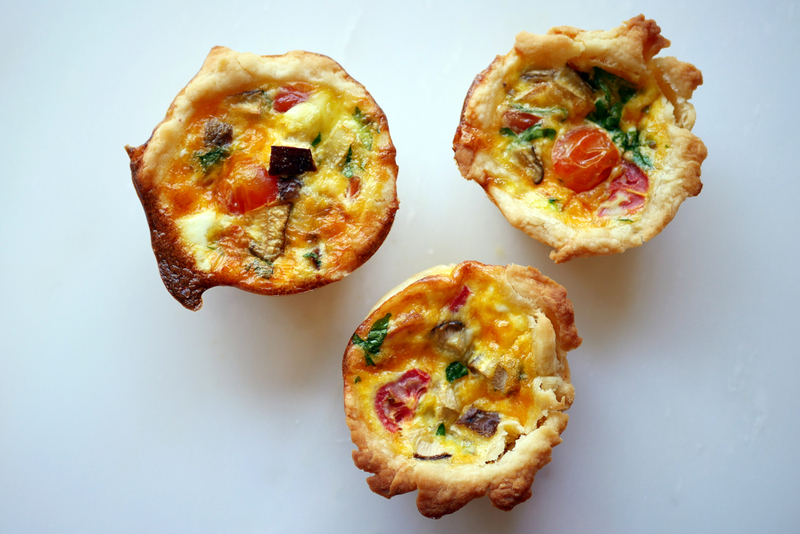 Completely bypass the pie crust for mini frittatas! Or do half and half for low-cal options. Sprinkle extra cheese on top of each cup before baking. Or substitute feta for an even healthier option. Roast vegetables beforehand, such as broccoli, asparagus and tomatoes. Adds to the prep time, but your tastebuds will thank you. Instead of mixing all ingredients with the eggs, drop in veggies and cheese separately. Then crack an egg in each cup for some ooey gooey goodness. I have’t tried that yet, so the baking time may be different—be sure to keep on an eye on it.